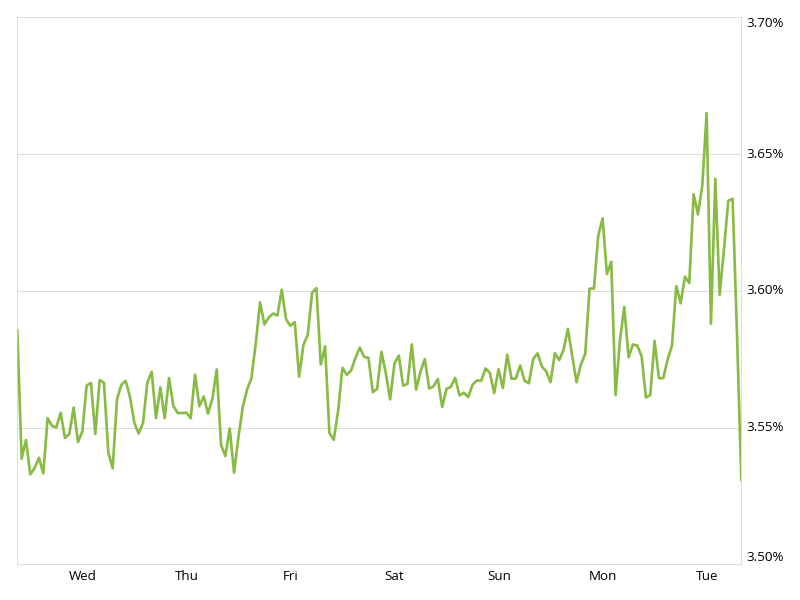 Mortgage rates for 30-year fixed loans rose this week, with the current rate borrowers were quoted on Zillow Mortgages at 3.58 percent, up 3 basis points from this time last week. The 30-year fixed mortgage rate rose throughout the week before dipping to the current rate on Tuesday. "Rates inched up last week as new data suggested the U.S. economy is on increasingly stable ground despite March's weak jobs report," said Erin Lantz, vice president of mortgages at Zillow. "Mortgage markets remain extremely sensitive to the ups and downs of economic news, but overall we expect the trend of gradually rising rates to continue this week." Additionally, the 15-year fixed mortgage rate this morning was 2.87 percent. For 5/1 ARMs, the rate was 2.83 percent. Check Zillow Mortgages for mortgage rate trends and up-to-the-minute mortgage rates for your state, or use the mortgage calculator to calculate monthly payments at the current rates.